The way I speak about my infatuation with Cludo -- how Cludo makes my life complete, how Cludo is able to finish my sentences (literally), etc. -- often elicits concerned questions from my close friends. "Uh, Liz, you're married. Does Patrick know about Cludo?" Yes, he does. And he has nothing to worry about. Why am I talking about Cludo today? Because they just announced another exciting update to their product -- a new machine learning-based feature called Intelligent Autocomplete. Google's Custom Search Engine is the most well-known site search solution due to brand recognition, as well as ease of installation and use. With it, you can add a Google search bar to your website with some limited customization options, so people who come to your website can search for and discover content. Google CSE does a serviceable job in removing the friction for website visitors to discover the content they want quickly, but it doesn't really allow site owners to deliver customized site experiences to users the way Cludo does. If someone types "seo 2019," I can immediately redirect them to our advanced digital marketing analysis guide on that very topic -- Is SEO Dead in 2019? You can either create a text banner that's clickable, like this example shown above for our upcoming webinar on how any business who's committed to video can bring their production in-house. In short, Google CSE is fine. But if you have a lot of content and you want to create a more helpful, intelligent, tailored site search experience for users -- while also being able to promote the most important offers and content pieces in a way that's relevant on your website -- Cludo is the only choice. Much like Forbes, Cludo is using machine-learning and AI for good with their new Intelligent Autocomplete feature -- more specifically, to help marketers/content nerds, not replace them. What is Intelligent Autocomplete? It's much easier to answer that question by showing you. In this case, the searcher meant to type "hubspot" instead of "husbpot," but Cludo won't try to figure out the difference or course-correct the user until they hit enter to render their search results. Here is where you see the Intelligent Autocomplete magic. 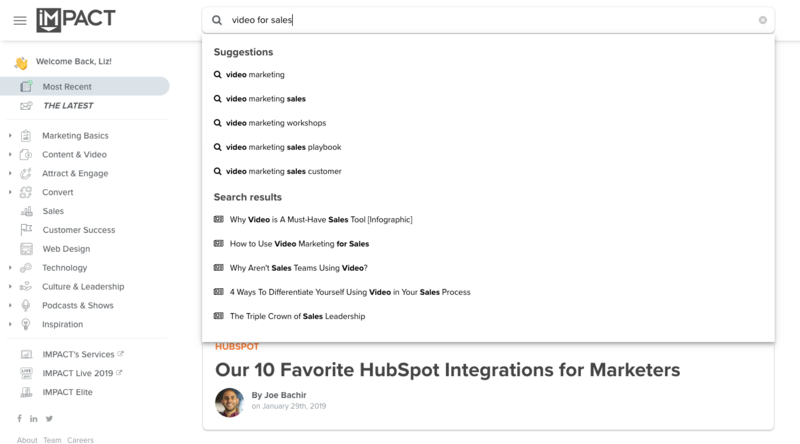 The "husbpot" searcher is given suggestions before they hit enter (in almost real-time) -- and "hubspot" is the first suggestion provided. Previous versions of their tool provided suggested content, but not to this degree. For those who fear change, Cludo has made it an optional setting that can be turned on or off any time. At IMPACT, we define the inbound methodology as being as helpful as possible in order to lead others to success. Typically, we think about this in the literal sense, as marketers -- for instance, answering the most important questions potential buyers have about our services and products through our content. But this update from Cludo shows that we can also go out of our way with our websites, too, to create experiences that are genuinely helpful. Experiences that allow people to find the answers to their questions -- or solutions to their problems -- faster, with a presentation and UI that are intuitive and predictive. Whether using a tool like Cludo makes sense for your business or not -- it's not for everyone -- this is the mindset we all need to be embracing. We need to challenge ourselves every day by asking, "Our content is helpful, but how can we make our website more helpful and user-focused?"